Really? In April of 2011, when these bike lanes were discussed, the Mayor said the City would be spending $10 million for 33 miles of bike lanes, which would be $303,030 per mile, not $50,000 to $200,000 as claimed by Lutz. Here's a link to my blog entry on the subject. Since the Star article I linked to has been taken down, here is a link to the Mayor's campaign website which reposted the Star article. This afternoon, the day after the Mayor's bike ride, I drove up and down the stretch of Lafayette Road (71st Street to 96th Street) that has the new bike lanes Mayor Ballard was promoting. The temperature was a pleasant 75 degrees, perfect weather for bike riding. How many bike riders do you think I saw using the Lafayette Road bike lanes? Zero. As a person who has regularly commuted by bike to work for the past last seven years (10,000 plus miles), I am all for making bicycling in the city more safe. Spending millions to slap down a line of paint on a road without any thought to whether those bike lanes are safe to use is not the way to improve bicycling in Indianapolis. ﻿﻿In most cities that develop bike lanes, there is a debate among bicyclists about how to design those lanes so they are actually safe to use. In Indianapolis though the recreational bicycling community, and not serious bicycle commuters, runs the debate. Those in the recreational bicycling community are so thrilled that someone is finally paying attention to them that they never speak out to question whether the bike lanes being developed are actually safe to use. They are not, which is why most serious bikers won't be using them. That doesn't make sense to say that the dedicated lane out of the line of traffic would not be safer than riding in the traffic lane driving us crazy not obeying rules and in general being a pain to avoid not using common sense- surprising us when we turn a corner and there is bike rider- the list goes on about bike riders which most of the general public find to be hazard on the main traffic lanes. 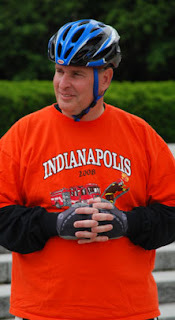 Guest, Indiana code says bicyclists have the full right to use roads as long as their bicycles follow state code and municipal ordinances, and fully comply with all other traffic laws. I think the specific code for bicycles is it must have breaks, must have a rear and front light, and must have a bell, horn, or some other type of noise making device. If a motorist is "surprised" by a bicyclist that is using the road complying with municipal and state law, then that motorist isn't paying attention and the fault is completely on them. You do know you're supposed to pay attention to the road while driving, right? And yeah, there are bicyclists who don't obey the rules of the road. Guess what? There's motorists that do that as well. Hell, most police departments get tons of money to track down motorists who don't follow traffic laws, and I do know that bicyclists have also been ticketed for running red lights, not signaling at a turn, and so on. Finally, riding in a road in the lane is safe because it makes the bicyclist visible to other users of the road. Pushing them off to the side puts them in danger of all types of debris that gets swept to the side of the road, or motorists who weave in and out of bike lanes. Guest, there arre a lot of reasons why. In bike safety classes, they teach you to "ride wide" so the motorist sees you and then you move over to the side of the raod. If you're already at the side of the road, confined to a narrow bike lane, the motorist may well not see you and may drift into the bike lane. There's a lot of reasons why a motorist might not see you at the edge of the road....fiddling with the radio, talking on the cell phone, texting, etc. In a public relations message, Mayor Ballard said bicyclists should alaways ride as far to the edge of the road as one can, even without bike lanes. That's absolutely the wrong advice. Bike lanes at the side of the road often fill up with glass, debris, potholes, etc. Sometimes people park in the bike lanes. Those can cause you to suddenly swerve into a traffic lane. One of the biggest dangers with bike lanes is when you have great speed disparity between cars and bikes. Downtown you can bike almost as fast as cars travel. It's very safe. Indeed, probably the easiest place to commute by bike in the city is downtown. The lanes are very wide and you have plenty of room to manuever. The lanes rarely fill up with traffic. Bike lanes mean lost traffice lanes and narrower lanes. That makes driving more dangerous for drivers and bicyclists are endangered when driving is less safe. If you google on the Internet you will find plenty of bike safety experts who say poorly designed bike lanes make biking less safe. Guest, I wrote my response for why bike lanes are safe. But bike lanes sure don't make driving more safe either for many of the same reasons. The wide downtown street lanes have been narrowed due to bike lanes. In some places complete lanes have been taken out. On Lafayette Road today I noted that the wide lanes have been narrowed for the bike lanes so signficantly that the car barely fit in the traffic lane anymore. "You do know you're supposed to pay attention to the road while driving, right?" Oh please, you guys. Sorry, spare the lectures and snide remarks such as above. Bike riders are a general nuisance on the main roads regardless of the laws permitting them because they are trying to compete with a car nor can they match the speed. Some of you guys have an in your face attitude not moving over and passing repeatedly on the right. There are more offenders than safe bikers. In addition areas where they can bike they don't want to, they would rather be in with the cars driving us nuts. Bike lanes-yes and you guys need to be in them. Guest, treat a bike just like any other vehicle. You can pass it. It's not that complicated of a concept. "There are more offenders than safe bikers". Prove it. What's your source? Source-50 yrs of passing you and being concerned you may run into me. So in other words, you made a broad generalization and have no factual basis to back it up. Nice to know. It'd be easy to make generalizations about motorists as well. I mean, governments issue grants to police departments to crack down on motorists who drive under the influence, speed, and run stop lights/signs all the time. Does this mean all motorists are bad, or most, or even many? No. It does mean there are motorists who don't obey the rules of the road, but people like "Guest" are all too willing to give them a pass while holding bicyclists to a standard of purity they don't hold themselves too. Guest, I actually agree with you that there are many roads bicyclists should steer clear of not because the roads belong to cars, but because those roads are simply not safe for bicyclists, even with bike lanes. I would not want anyone I cared about riding on Lafayette Road or Allisonville Road. The speeds of the cars are too great there. I also think there are a lot of sidewalks and paved paths in suburban areas that are better than encouraging people to ride on busy roads. For example, between me and Eagle Creek Park there is a nice paved sidewalk/path that I would use over 56th Street. Indy Student knows where I"m talking about. I don't agree though with your general hostility toward bicyclists. You seem to have other issues, not connected to safety. You do realize that cost includes repaving the entire street? Bike lanes cost very little. Geesh, fellows, other issues besides safety. Now you are having fun. I give bike riders a lot of space but some observations led to the comment and only logic on your part would realize I was not addressing all bike riders just most of them based on observation. One guy repeatedly passed drivers on the right at stop signs and lights on Springmill no less and putting up with that for way too long when I got the red at Kessler and Illinois I pulled way over so he could not pass again. He actually picked up his bike and ran through the field there, got back on the road where I passed him again..... you guys are not fun. Yea for bike lanes. End of discussion. I've never, and will never, understand why these conversations always seem to devolve into such a snide and antagonizing tone. Insulting, patronizing language has no place in this discussion.